Global warming is not just controversial, it's also pretty confusing. As world leaders debate in Copenhagen, politicians in Congress are pushing different plans to deal with climate change. Christopher Hayes breaks down the difference between cap and trade and a carbon tax. Krugman vs. Hansen! Lieberman vs. Collins! Cap and trade vs. carbon tax! Global warming is not just controversial, it’s also pretty confusing. As world leaders squabble in Copenhagen, politicians in Congress are pushing different plans to deal with climate change. To help make sense of the debate, The Nation‘s Washington, D.C. Editor Christopher Hayes breaks down the difference between a cap and trade plan and a carbon tax. Note: This is the beta launch of a new audio feature from The Nation, "The Breakdown with Christopher Hayes." Each week we’ll take questions from readers about confusing terms you’re hearing in the news, and then we’ll choose one to demystify! This is also the beta launch of our new audio player. We welcome and encourage your feedback about the new feature and the audio player. Please send comments to radionation [at] thenation [dot] com. 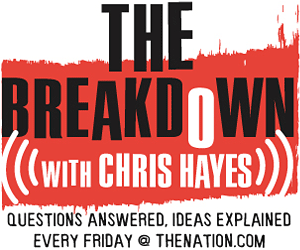 If you would like to submit a question for the first 2010 edition of "The Breakdown," tweet Christopher Hayes, @chrislhayes, or email thebreakdown [at] thenation [dot] com.